The Capitol Arts Center has entered the next chapter in its long history of providing a place for south central Kentucky residents to enjoy the arts and now operates under the management of the Southern Kentucky Performing Arts Center. The Capitol currently houses the Houchens Gallery, Mezzanine Gallery, SKyPAC’s Education and Gallery Department, hosts touring performances and concerts, local theater productions, and community events, along with SKyPAC’s Youth Theater. The Capitol Arts Center has been an important part of the cultural fabric of Bowling Green for over 100 years. 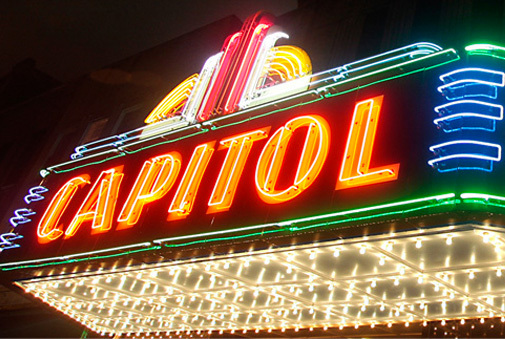 Begun as a vaudeville house in the late 1890’s, then was renamed the Columbia Theatre and finally was redesigned as a movie house in the mid-1930’s renamed the Capitol Theatre which presented movies for more than three decades before closing in 1967. After remaining vacant for more than 10 years, the building was purchased in 1977 by a visionary group of citizens formerly known as the Bowling Green-Warren County Arts Commission. Following a $1.3 million renovation, the Capitol Arts Center opened its doors to the community in September 1981 and was managed by the Capitol Arts Alliance for 30 years. The Capitol Arts Center is located at 416 East Main Street on the north side of fountain square park. Donors who share a commitment to vibrant, best-in-class performing arts and dynamic educational and outreach programs should consider a sponsorship opportunity. SKyPAC offers benefits designed to add value to donors and to help achieve specific objectives through sponsorship.